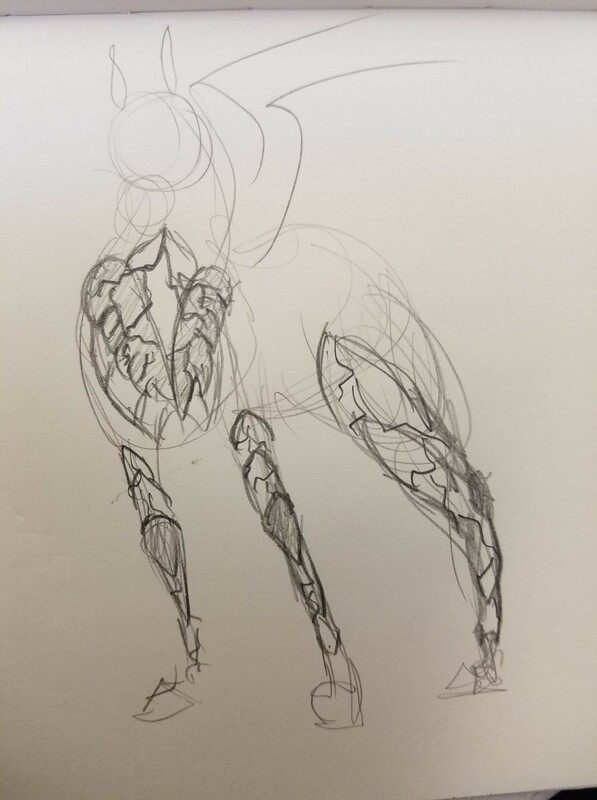 As a foal, Theodosia is light and airy, almost as though she might be something more than mortal -- all long legs and sleek lines, the barest hint of her ribs peeking out from beneath her pale coat, and as an adult little has changed about her frame. There is a delicate dish between her eyes reminiscent of a desert ancestry, leading into a slender neck. Her base coat is an off-white perlino with lavender stripes that barely contrast in their lightness, with pink skin showing through the areas with thin fur such as her muzzle and around her eyes. While hard to see, each foot is marked by a white sock, and a white diamond is nestled between her lavender eyes. Her mane and tail are equally long and luxurious, a pale off-white that often curls into itself. She always wears white roses in her mane, fastened there by a silver chain from which small rose quartz decorations tastefully fall. Her antlers appeared early, at around two years of age as opposed to the normal four years (possibly a result of her sire’s blood), and the rose quartz crystals began appearing at about three years old. Her wings are the same perlino as the rest of her body, with lavender tips on the guard feathers. 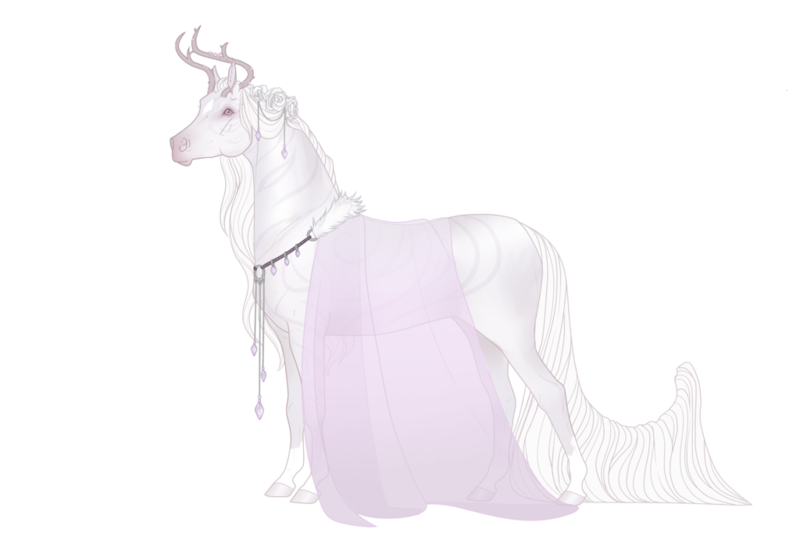 Her hooves are a pale pink, lightly cloven and reminiscent of a deer's feet. There is a mouth-shaped scar near the top of her crest from a battle with Marisol, along with a jagged scar along her left flank from Israfel's horn during their fight. She learned the harshness of the world at an early age, and it has always been a lesson that stuck with her -- that the weak in the world need an advocate, that those who are frail need a protector, that sometimes compassion may be the only way to win a battle. She will be the first to step up to defend someone who needs it, perhaps a little too quickly sometimes due to youthful exuberance (and perhaps a slight arrogance). She’s been known to rush headlong into decisions without considering all the options, getting her into plenty of troubles and scrapes along the way. She loves as strongly as she does anything else, quick to develop feelings but slow to lose her fire -- whether platonic or romantic, she is loyal to a fault to those she surrounds herself with, and finds herself a little lost without a support network in place. Despite renouncing her Olympian heritage, she still walks with her head held a little higher than most, and finds herself preening and seeking to impress in large groups or events. New to the experience of being without a watchful eye upon her, Theodosia is perhaps a little wilder than one might expect -- eager to experience life upon her own merits, and to be seen as a capable adult. She wants adventure, to be living life her way instead of how the Gang did it, as much as she adores the motley crew she calls her family. Something in her calls to duty, to wanting a place to settle down and call her home -- a place to protect and people to mingle with that are perhaps usually not criminals of some sort or another, perhaps even a title to replace the one she left behind when she realized her sire wasn’t anything she wanted to be. 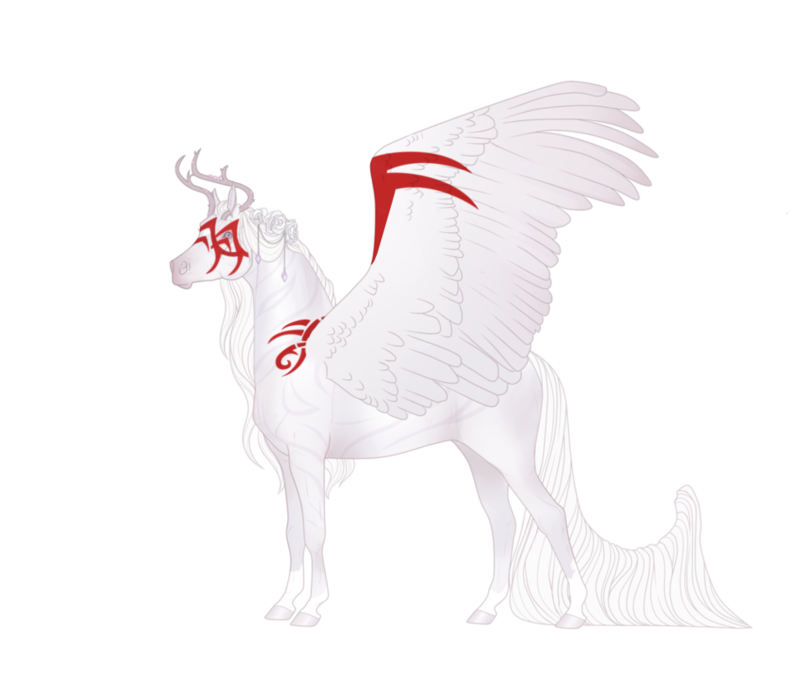 Born in Caeleste in the Early Spring to the fallen god Thyterios and his mortal lover Anzhelo Valois, her conception between two males made capable by the magic of her native lands. She found herself often ignored by her god-like Sire, who had better things to do than entertain his half-mortal child, and absolutely adored by her Dam despite how hard his pregnancy and subsequent c-section was on his already fragile body. In her first few days of life, she found herself learning what relationships should not be -- the callous curl of her sire’s lip whenever he looked upon the bleeding Anzhelo when her Dam had pushed herself too far, in the way he sent her Dam on needless errands to the City despite her Dam’s faltering steps. In her earliest days, she learned how a face, crumpled with tears of pain, could so quickly turn around and compose itself just to soothe another. She followed him around the marketplace as he limped, her little hooves clattering on the cobblestones, and she never noticed the shadow-colored mare whose eyes never left the pair until they were suddenly herded into an out-of-the-way alley. The mare offered compassion in a hushed whisper, and salvation if her Dam could only be brave enough to accept the offer of safety from her overbearing Sire. Elysium was her name, and she led them away from the Celestial City that very day, stopping whenever Anzhelo needed to rest and muttering angrily under her breath whenever she saw the state the fragile male was in. She brought them to a motley crew of horses that lived out in the forest, out of the reach of the laws they rarely agreed with. She grew up here, amongst outlaws and mercenaries, beneath the watchful eye of her Dam -- Heretic taught her to fly with cheerful enthusiasm as his mate cheered them on, and Sam taught her the rituals she would need to protect her mind and soul while his sometimes-lover rolled his eyes and scoffed. Her Dam taught her to run quickly and silently, to hide herself amongst the foliage so that others would not notice her. Elysium taught her what it meant to be strong, both physically and mentally. Her Dam remained with the small, nomadic gang, but as she approached her third birthday she found herself longing for more. Anzhelo had smiled so sadly when she announced she was leaving, but he had still tucked fresh roses into her hair and pressed a soft kiss to her forehead, reminding her that he loved her and that would never change. She flew for days, until she found the land of Novus unfolding before her -- and here she is now, eager to make a fresh start in these new lands. Discipuli While she may have been blessed with storm-calling due to her heritage, Theodosia is… not very good at it, honestly. Having been raised away from those who could teach her and having denied her status as a demigod for so long, she might as well be starting from scratch — and her efforts show it. The best she can manage to summon is a few minor clouds and maybe a rumble of thunder that dissipates quickly and leaves her exhausted. Worst of all, her magic seems to be heavily in tune to her emotions, meaning that even a quick burst of anger can leave her drained from accidentally calling clouds to the sky. Vexillum Theo’s grasp on her more physical gifts -- the slightly increased strength/speed/healing from her demigod heritage -- has become more in-depth as she tests her limits, but her control of her actual magic is still fickle. She can now call up some rainstorms, but she pretty much just ends up soaked and exhausted without any real payoff -- unless you count managing a few jolts of lightning and maybe managing to direct them a bit as a reward in itself? Periti With a much better grasp on her magic (and her own limitations), Theodosia can now call in a fairly-strong storm complete with thunder and lightning shows, although they never seem to last for more than a half-hour at a time. She has almost-mastered her control over lightning, but being zapped is still pretty painful. Dominus Having mastered her magic, Theodosia can call in a Category 5 storm and hold it for extended periods of time, potentially bringing devastation with her should the mood strike. Her control over normal lightning, especially, is remarkable -- she can even run the bolts over her body/wings and no longer be affected, so long as she is concentrating on redirecting the energy away from her. Parvus Theodosia can create harmless heat & ball lightning that crackles over her skin / between her wings when she 'calls' to it (or when she’s particularly riled up), making for a spectacular light show. She has no actual control over this lightning, as it responds to her emotions and the situation around her. accessories -- often seen with roses tucked into her hair, with small silver chains helping keep the long locks contained upon her nape. from the chains dangle two small rose quartz gems that were gifted to her by her dam. warpaint -- a bright red paint derived from beets and holly berries mashed together, it is applied upon her face and shoulder in a fierce tribal pattern. along with this, it is painted on both the front and backs of her wings to designate her status as a fighter pilot and cadet in the Halcyon unit. armor -- an iron chestplate and leg bracers engraved with lightning and storm designs, held in place by leather strips. there is a small dagger sheath attached to one of the leather straps around her neck, which holds a small but wickedly sharp dagger. full outfit -- In addition to the roses and decorations in her hair, Theodosia often wears a white fur collar that latches around her neck, which holds up a sheer lavender veil that falls over her haunches. From the chest fastener dangles several more of the rose quartz decorations on silver chains, which often clink against each other and announce her presence. she was looking for a sword.